What inspired me to become a filmmaker/artist. Chip and Dale are worried about gathering enough acorns for the winter until park ranger Donald comes along with a bag full he's trying to plant. Four bored ghosts in a haunted house who've scared everyone away call up Ghost Hunters Mickey, Donald, and Goofy in hopes to have a little fun scaring them off. Santa Claus: [reading a letter] "Dear Santa Claus, I'd like a dolly. Merry Christmas, from little Molly." Santa's Secretary: Molly seems to be ok. She eats her spinach everyday. Santa Claus: Get Molly a dolly. Just watched this, a Walt Disney Silly Symphony, on YouTube. 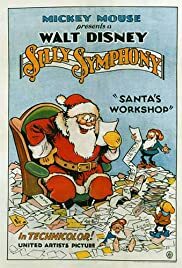 It's the first of two Disney cartoons that star Santa Claus (the other one was The Night Before Christmas). He checks his list which one of his elves monitor in a book that reveals each child's behavior. When one of the children is revealed to not have "washed behind the ears for seven years", Santa decides to add soap to this boy's long list of presents. Highly musically entertaining with some amusing gags like someone using a spider to scare some of the dolls' hair in an upright position and someone else painting exact checker squares in one fell swoop on a board. There's also one politically incorrect blackface doll that says, "Mammy!" to Claus that may be considered offensive today but was considered a highly amusing reference to then-star Al Jolson. Since it only lasts a few seconds, I don't think any harm is done. This was quite an entertaining animated short that I highly recommend to any animation fan especially Walt Disney completists. Children should enjoy this too.